My very first computer was a real beauty. It was, well, to use the technical term, a mechanical paperweight. This was back in the days when Windows 95, AOL, and the Internet as we know it was first being born. I had overclocked my computer so it was running roughly twice as fast as it was sold to do. I made a few other modifications to the computer to make it go lightening fast (relatively) and run really hot. A hot computer needs lots of fans running to keep it running. One day I came home and smelled…well, something. It was a something that I hadn’t smelled before. I also heard… nothing. This was bad too. 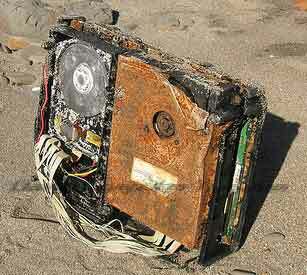 Now, in these days a computer didn’t have all the safety features built in to shut down a computer if it got too hot. Instead, the computer would try to keep running despite what was going on. Well the fan in my computer had died. When it died, the computer quickly overheated and fused the processor to the motherboard (this is considered to be a bad thing). I cracked the case and it was as bad as I had feared. The processor, motherboard, RAM, and modem (yes, modem) all needed to be replaced. So I began the process of procuring parts for my computer. First I purchased a new motherboard to put into the case. I ordered it by phone and had it shipped. It arrived, I went to put it in my case and…it didn’t fit. I thought about carving holes in the case to make it fit, but decided instead to buy a bigger case. I got the case, put the motherboard in, and my power supply didn’t fit in the new case. (Needless to say this was in the days before parts were all standard sizes). Hundreds of dollars later, I still didn’t have a working computer. Long past the time I should have, I cut my losses and sold off the pieces and almost broke even. Since then I’ve bought, upgraded, built, destroyed, and hacked many different computers. I’ve overclocked, overrun, overran, underrun, blown up many a processor in the pursuit of the ‘perfect balance’. Does this make me qualified to actually talk about computers? Not really. All it means is that I’ve learned a lot of ways on how not to make a computer go faster. It’s how I learned at least. Some people learn from reading manuals, taking classes, applying other people’s knowledge. I have to learn the hard way. So for those of you who learn from other people’s mistakes, please learn from mine. For those who have to learn the hard way–well, better start with a cheap computer. Chad touched down on this planet in 1980. Originating from the planet Triangle, he set forth on this planet determined to learn all that could be learned. When that proved impossible, he donned the guise of a houseplant for several years until the computer revolution made it possible to simply download all available information. His mission complete, he moonlights as a computer system technician, website designer, father, and lover of pickles.Originally a hobby, computers became a career when no other usable skills were discovered within his abilities. Chad’s antics can be followed on his blog Outside the fire.